**Gift card was received for this post, however all thoughts are my own. Have you ever wanted to accomplish something, but been told those dreams were out of reach? I think this is a story we are all too familiar with. People underestimate me because I'm very quiet. They expect that I am weak, or that I have nothing worth saying. For my husband, people underestimated him because of his size. He may look like a tough Marine now... but when he first joined he was a skinny little guy that people never thought would make it through boot camp. Throughout our lives, we will always have those people who doubt us for whatever challenges we may have. This is certainly true for my son. With his autism diagnosis, people often have a preconceived idea of what he can and cannot accomplish. It is made evident when people make the simple, seemingly innocent comment like, 'But he's so smart!' People hear that he is autistic and they automatically underestimate what he is capable of achieving. They underestimate his ability to interact socially. They underestimate his skills. They underestimate his brains. Sometimes, it's those naysayers saying you can't, that truly make us want to say, "Yes, I CAN. And I can prove it!" That's the attitude that we want to teach both of our children, but especially our son, knowing all the roadblocks he will face. So, in our house, we never tell him he cannot accomplish anything. When he wants to go to space? Absolutely, that can happen. When he wants to create video games, we're 100% behind him. When he wants to be the next Bill Gates, we support it 100% (and his daddy makes sure to let him know he'll expect an allowance when it happens). When he wants to run Sony, Nintendo and Universal all at once, sure, you got this! From the simple to the extreme, we embrace these dreams, we encourage them, and we do whatever we can to make those dreams of his a reality. We want for him to one day have that story of overcoming, of facing the obstacles and coming out better on the other side. We all love those kinds of stories, right? 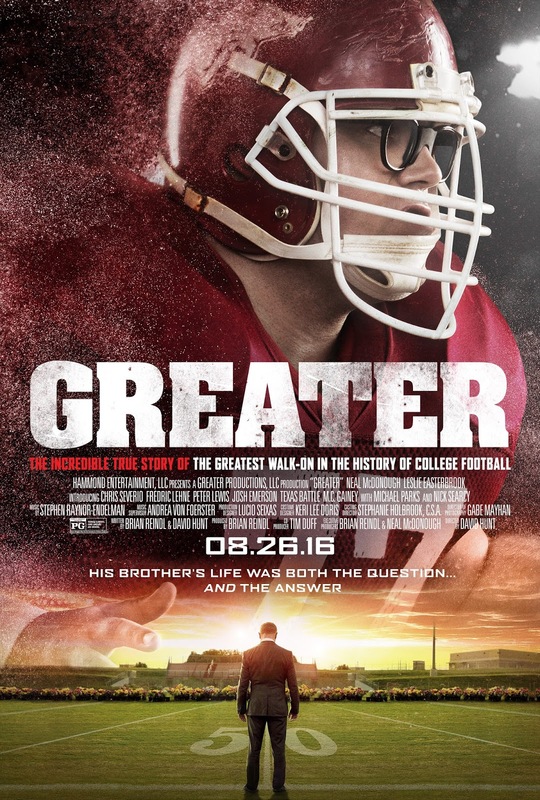 GREATER is an inspirational movie based on the life of Brandon Burlsworth. Brandon had one dream – to play for the Arkansas Razorbacks. Unfortunately, Brandon was a clumsy player who lacked the physical prowess to make the team. He was written off by coaches and teased by his fellow teammates. Undeterred, Brandon continued to show-up for practice. He woke up before anyone else and worked harder than anyone else, until his determination paid off. Not only was he given an opportunity to walk-on and play football – he became one of the greatest players on the field, and was drafted to the Indianapolis Colts. I was given the chance to screen this movie in advance of it's theatrical release, and I loved it. It truly is a movie that you will leave feeling inspired by. This amazing movie will be in theaters Friday, August 26th, and you aren't going to want to miss it! In celebration of this movie, I want to encourage all of you to think about those people in your life that have offered you encouragement to overcome great obstacles. Perhaps a parent, perhaps a teacher or coach, maybe even a pastor. Whoever that person may be, let them know how much it meant to you. Take them out for coffee, treat them to a Walmart shopping spree, take them to see this movie! Encourage the encouragers and let them know they are appreciated. And be an encourager yourself, letting those in your life know that you believe in them, wholeheartedly just as someone once believed in you! Is there someone in your life who has inspired you to be greater? Share your stories in the comments, and don't forget to head to the theater on August 26th to see the movie for yourself. I've not heard of this movie and I can't wait to share with my hubster's as he loves these types of movies! I had a teacher in fourth and fifth grade who was my inspiration for so many things. It was an open classroom and she encouraged creativity and learning at our own pace and way! I heard that she passed away so I never had the opportunity to thank her! So awesome!! I love these movies!! Inspirational true life stories are my all time favorite! !